Bequeathed by Sir Victor Wellesley in 1954, London. 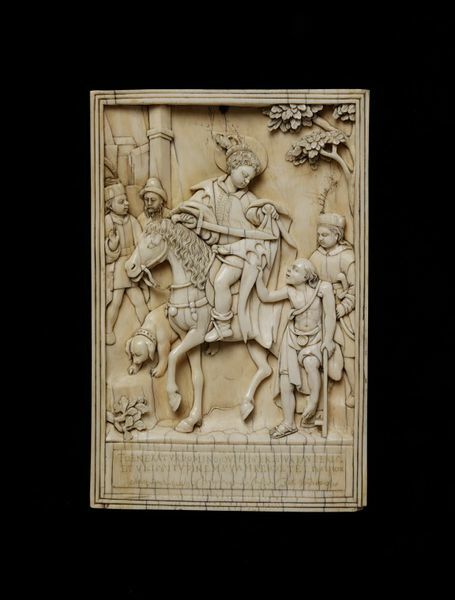 Ivory was popular as a material for religious subjects, especially during the 17th and 18th centuries. Spanish and Portuguese patrons imported ivories carved with Christian imagery from their territories overseas, such as the Philippines, Mexico and Goa. 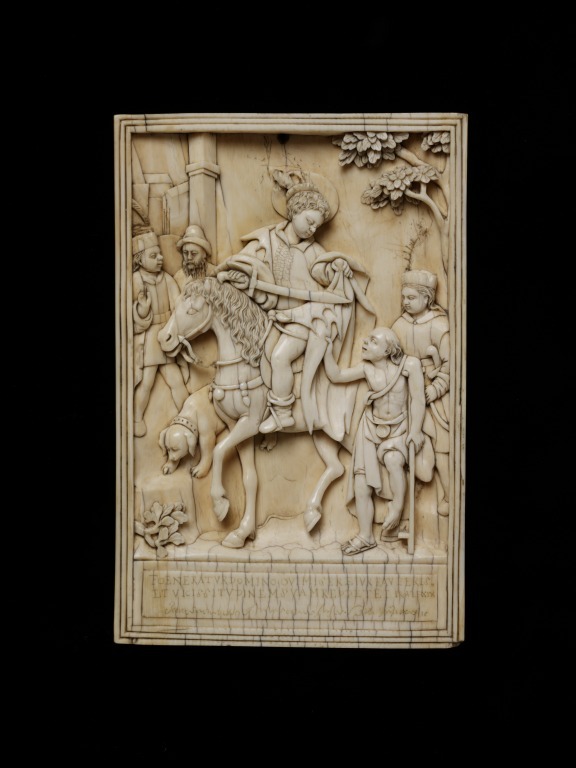 German and Netherlandish artists were renowned for their dexterity in ivory carving. Their reliefs are masterpieces of composition and virtuosity. On this relief St Martin is shown dividing his cloak to give half to a beggar. This composition is based on a Netherlandish print. The Chinese carver copied the devotional inscription in Latin from the print ("He that hath pity on the poor lendeth unto the lord; and that which he hath given will he pay him again"), but the cursive script underneath, which probably gave the names of the engraver and publisher of the source were rendered indecipherable on the ivory. The relief is based on an engraving from the late sixteenth century by the Flemish print maker and designer Adriaen Collaert, after the Flemish artist Johannes Stradanus. St. Martin on horseback, divides his cloak with a sword and is presenting it to the crippled beggar leaning on a crutch on the right of the relief. Behind the beggar and slightly further to the right is a young man, above him the branches of a tree. On the left are two older male figures, before an architectural background, and below them, a hound. At the foot of the relief is a panel with two inscriptions, one of which is in a cursive script and indecipherable. A hole has been drilled into the top of the relief for suspension. The horse's bridle is broken. Indecipherable. Probably gave the names of the engraver and publisher of the Netherlandish print it copied. 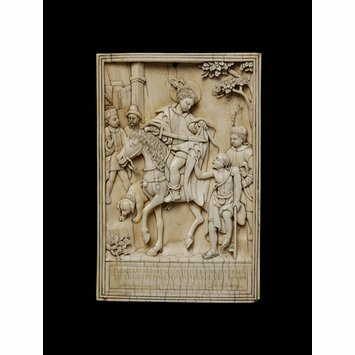 This relief is based on an engraving from the late sixteenth century by the Flemish print maker and designer Adriaen Collaert, after the Flemish artist Johannes Stradanus. The carver copied the devotional inscription in Latin from the print ("He that hath pity on the poor lendeth unto the lord; and that which he hath given will he pay him again"), but the cursive script underneath, which probably gave the names of the engraver and publisher of the source were rendered indecipherable on the ivory. The style of carving, fusing Asian and European forms, is typical of ivories of sacred subjects made in China and the Philippines for export to Spain, and it is likely to date from the late sixteenth or early seventeenth century, based on the late sixteenth-century engraved source. Based on a Netherlandish print. By a Chinese carver.